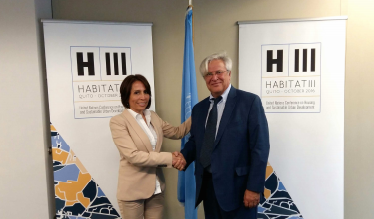 Dr Joan Clos, Secretary-General of the Habitat III Conference, and H.E. Ms María de los Ángeles Duarte, Minister of Urban Development and Housing of the Government of Ecuador, signed today a framework agreement between the United Nations and the Republic of Ecuador on the arrangements regarding privileges and immunities concerning United Nations meetings held in Ecuador, including the Habitat III conference next year. With over one year to the Conference, the agreement marks a milestone in the preparations for Habitat III in the host country that already started some months ago. “Signing this agreement is one-step more in our road to Quito 2016’’, Dr. Clos said. ‘‘Our goodwill is to strongly cooperate with the Government of Ecuador throughout the process to have a successful Habitat III Conference and a fruitful way towards the New Urban Agenda. The opportunity is unique and Ecuador has offered to host it and lead it’’. From the Ecuadorian Government’s side, Ms. Duarte has reiterated the commitment from the Government of Ecuador for an innovative and action oriented conference, and the need to highlight the relevance of sustainable urban development in the overall development agenda, especially in the framework of the adoption of the Sustainable Development Goals. ‘‘We invite everybody to Habitat III in Ecuador next October 2016. The New Urban Agenda is about the future of our cities. It is about having more equity, just, safe and resilient cities. It is about each of us, citizens of the world’’. The Habitat III Conference is the United Nations Conference on Housing and Sustainable Urban Development to take place in Quito, Ecuador, on 17-20 October 2016. In resolution 66/207 and in line with the bi-decennial cycle (1976, 1996 and 2016), the United Nations General Assembly decided to convene the Habitat III Conference to reinvigorate the global commitment to sustainable urbanization and to focus on the implementation of a New Urban Agenda, building on the Habitat Agenda of Istanbul in 1996.